…There’s already been plenty written about Matt Cain. Some of my favorites are available here and here and here. Read them. If you are opposed to professional athletes earning exorbitant amounts of money, this conversation is not for you. If you are wanting to debate the merits of a won-loss record, please don’t talk to me about Matt Cain. How much a player is worth, and how you determine worth, is an important conversation, but it has nothing to do with this post, and, in my opinion, it has nothing to do with Matt Cain. Matt Cain is important to the Giants. Is he the Giants best player? No. Is he even their best pitcher? No. (Side note: the Giants will be paying 3 pitchers roughly 20 million dollars a year to a throw baseball every 5th day and it’s quite possible that none of them are the teams best pitcher…wierd sport). But, Matt Cain was the great right armed hope of Giants’ future back in 2006. The Barry Bonds era was coming to a screeching halt. All that was left was a fascinating and bizarre march to the all-time home run record. Winning had nothing to do with those last two years. But there was hope. There was talk of a future built around pitchers and players the Giants had drafted and no more sagging veterans to prop up Barry’s ego. Matt Cain was the first. Later there would be Timmy, and the Panda, and Brian Wilson, and, of course, Buster. But Matt Cain was the first. And it did happen. In a weird, hybrid kind of way, it happened. Young players, mostly pitchers, drafted by the Giants led the team a World Championship. The only one in San Francisco history. Not Mays, not McCovey, not Clark, not Bonds. Matt Cain and company. Matt Cain has never given up a run in the playoffs. 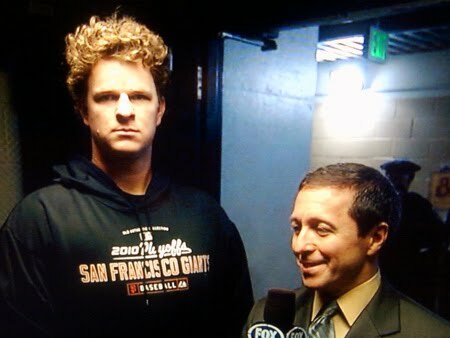 To lose Matt Cain would have meant a lot of things, but mostly it would have shown that the Giants lied to us. It isn’t really about pitching. It isn’t really about drafting well, developing players, and keeping them around. At some point, there is going to be someone who walks. It might very well be Tim Lincecum. I hope it’s not. They can’t keep everyone who comes through the system and succeeds. But Matt Cain was the first of this wave, of this new commitment and direction, and he could not leave. Couldn’t. And that is why, even though the numbers seem ridiculous, he had to stay. Had to. This entry was posted in Giants and tagged contracts, giants, matt cain. Bookmark the permalink.